Evil Dead II appears in an aspect ratio of approximately 1.85:1 on this single-sided, double-layered DVD; the image has been enhanced for 16X9 televisions. This transfer fell into the “silk purse/sow’s ear” category, as it seemed to represent the flawed source material about as well as I could expect. Print flaws were surprisingly absent. The image turned a bit grainy at times, a factor that became almost inevitable given its origins. However, these weren’t a big distraction, and I noticed no other form of defects. Colors were subdued and somewhat pale but they seemed largely accurate, and I noticed no problems related to them such as bleeding or noise. Black levels looked a bit mushy to me and they lacked boldness or depth; there's a mildly tentative quality to the dark scenes. Shadow detail often appeared a little heavy. I didn't have a terrible time making out the action in low-light shots, but since these kinds of scenes dominated the film, I had more trouble than I should have. Evil Dead II will never be a particularly attractive film, but this new transfer moderately topped the prior one. The biggest improvement came from the absence of source flaws. The old transfer suffered from heavy grain at times, but the new one tamed that to a substantial degree. Otherwise, I thought the two images were pretty similar. The new one didn’t blow away the original, but it deserved a jump from that transfer’s “C” to this one’s “B-“. Unfortunately, the new disc included the same Dolby Digital 5.1 soundtrack as the prior release of Evil Dead II. Actually, some parts of it seemed positive, such as the breadth of the soundfield. The action spread nicely to the side channels, with a great deal of effects and music emanating from the front right and left speakers. This usage added a nice component of involvement to the mix, especially when we consider the extra kick boasted by the rears; the surround speakers presented solid ambiance and occasionally tossed out some good split-surround effects as well. The track lacked the smooth integration of true 5.1 mixes, but it worked nicely from a soundfield point of view. 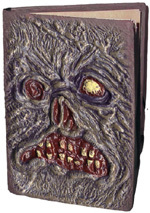 This “Book of the Dead” edition of Evil Dead II incorporates a mix of supplemental features, most of which come from the prior DVD. First up is an audio commentary which comes from a 1998 laserdisc release of Dead II. It features Campbell, Raimi, co-writer Scott Spiegel, and special make-up effects artist Greg Nicotero, all of whom were recorded together for a running, screen-specific chat. 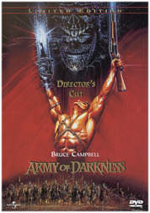 In the piece for Army, it was just Campbell and Raimi, though brother/co-writer Ivan Raimi entered about halfway through the track. In a reverse of usual patterns, the actor dominated the proceedings. However, that's not the case here, where it seems as though all four men provide roughly equal amounts of information; Raimi is much less subdued than he was during Army. Although the Dead II commentary is more fun than that of Army, it's probably less informative, which is often the case with multiple-participant tracks. Frequently these become very loose and disorganized as the parties involved become more interested in laughing with each other than in providing compelling information about the movie. The Dead II commentary straddles those lines, and it generally seems fun and useful, although at times it goes a little astray. Still, I enjoyed the commentary as a whole and found it pretty entertaining. After this we get a new component: a documentary called Evil Dead 2: Behind the Screams. This 17-minute and five-second show offers a running set of behind-the-scenes stills and other elements like concept art along with commentary from crewmember Tom Sullivan. We see many fun shots from the set and elsewhere, and Sullivan helps let us know what we’re examining. It’s a pretty nice set. 50 images pop up in the Poster and Still Gallery. This mixes photos from the set with movie shots and some ads. Some of these appeared in the old disc’s “Still Galleries”, but since that release included 87 frames of material, obviously we lose some here. Finally, we get the original theatrical trailer for Dead II plus Talent Bios for Campbell and Raimi. These are actually pretty solid little entries that provide more depth than usual for these listings. Also on DVD presents ads for The Evil Dead, Man With the Screaming Brain, Dead and Breakfast and a video game. Note that these promos show up at the start of the disc as well. In addition to all of these DVD-based materials, the “Book of the Dead” edition of Evil Dead 2 includes some packaging components. Most noticeable is the case itself. “BotD” comes in a special rubber package that’s supposed to look like the book found in the flick. Created by Tom Sullivan, this offers some cool artwork, the chapter selections and a listing of “special thanks” from Sullivan. If you press the eye on the front of the package, you’ll hear a scream. This whole packaging concept remains fairly pointless, though I’d probably like it better if the rubber didn’t smell so bad. Evil Dead II offers an over-the-top horror flick that didn't truly light my fire but made for a generally fun piece. It’s not the best of the series but it has its moments. The DVD features pretty decent picture with harsh sound and a few good extras. 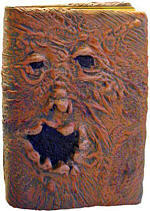 I believe this “Book of the Dead” edition of Evil Dead 2 offers the best visual presentation of the film found on DVD. It suffers from the same problematic audio as the prior release, though, and it doesn’t include substantial new supplements. If you must have a moderately better looking version of Dead II, go for this one, but with a list price of almost $40, it’s awfully expensive. You might be better off waiting for the probably inevitable cheaper issue of this one; it’s not worth the money to pay for the gimmicky packaging.